Fresh from the recent 3-day May the 4th Star Wars Extravaganza, from May 4-6 at Gardens By The Bay, world-class accomplished photographer Eddie Sung shot an epic group picture of the costumed characters (from Singapore, Taiwan, Hong Kong, Indonesia and Malaysia)of the Star Wars universe, all assembled on the Supertree Skybridge. We take this opportunity to ask Eddie what were some of his other favourite Epic Images. Epic Shots of Eddie Sung! Q – How was the recent May 4th Event? We hear you are always involved with this event? Definitely! This is my fourth time shooting this amazing and fun event. I’ve been shooting since the very first event. Always a fun time hanging out with the crazy and dedicated gang with their spouses and family. Hmm. It seems I only hang out and photograph Rock Stars and Star Wars characters. Hahaha. Stars Wars Contingent – This was the epic image captured on top of a Supertree. It was a challenge to get every one in their colour coordinated positions. I had two assistants. One next to me on the ground to “talk” to another up on the Supertree, shouting spacing and positioning orders to the troops. The result was a very symmetrical image. I’m proud of this image. It brings back great memories from the awesome event. 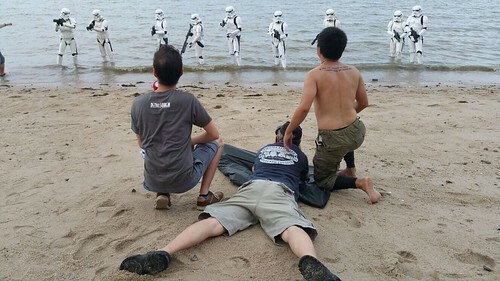 Stormtroopers – This was shot as a homage to the Rogue One movie, at Changi beach. It’s the brainchild and personal request of Hansen Khoo, one of the 501st Legion. There were two versions of this image. One was a Coloured one, which was used as the cover of a nice folder containing three commemorative cloth patches, sold with proceedings to charity. 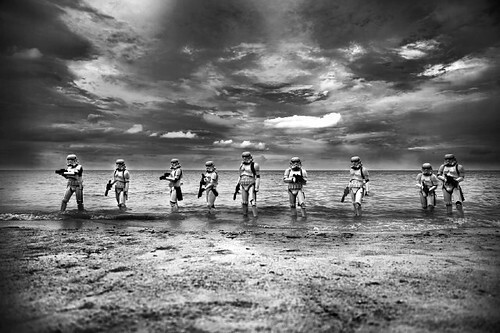 This B/W version of the Stormtroopers is done in my trademark stormy mood style. 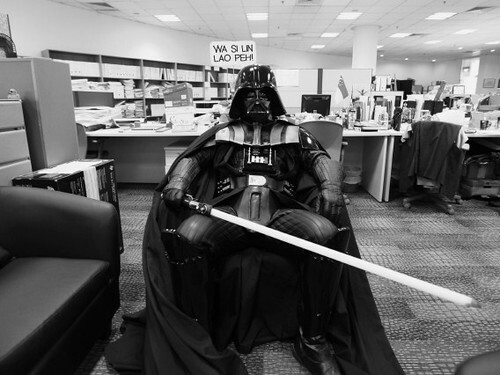 This seated Darth Vader image was captured during the first event. 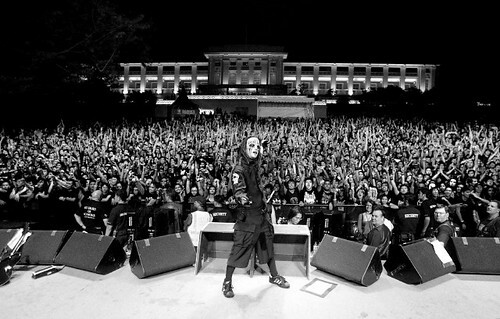 It was subsequently used as a publicity image and a giant stage backdrop for the second event. Q – What do you mean by Stage & Staged? My epic shots were taken either from the Stage or Staged with careful coordinations. The Star Wars images were staged, closely coordinated and implemented. Like they say, it takes a Village. As you can see, my assistants can be seen shouting positioning orders to the Troopers to be carefully aligned. Q – How long does it take to capture those epic moments? The Stage shots are mostly split-second pressing of the camera shutter, with alert instinct and a quick framing eye. The Staged ones can take from an hour or up to weeks to carry out because we need clearance from public or premise authorities. All worth it if the resultant image is an epic one. Q – Was it stressful to shoot the Supertree image? Not really. Like herding cats. I thank my assistants for their help while I focused on my Vison. Most of the character positions were sorted out on the ground and in the shade. Before moving up to the Supertree. Up there, it was just getting the central figure in the centre of the Supertree trunk. 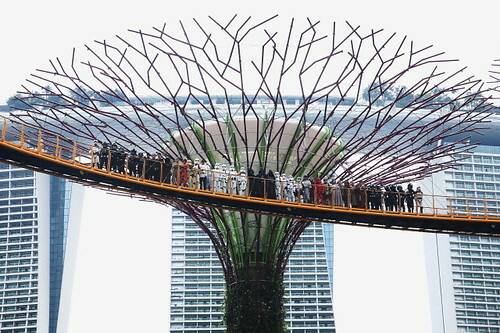 You can see the three towers of MBS in centralised positions, the red characters aligning nicely with the edge of the Supertree trunk. Q – What camera equipment did you use? I rely on the Canon system of cameras and lenses. Mostly 5D Mk3 & Mk4 with a trusty host of precise “L” lenses. It’s important to feel at One with your camera and lens. Like a warrior in the battleground, your weapon cannot fail you. I’m known for my “One Shot, One Kill” split-second accuracy images, my camera must not jam or misbehave. I thank the Canon support team for their assistance at making sure my arsenal is in tip-top condition. 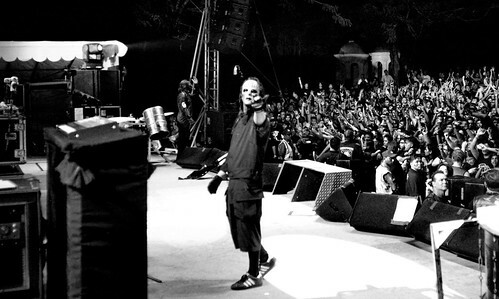 Q – We see some of them does not belong to the Rock Photography genre. What does the subject or scene have, before you press the camera shutter? In general, I shoot people that I respect. Rock Stars and Star Wars characters. Haha. The image that I capture, must always be Compelling. When I take the shot, the image must be Iconic, have Soul, have Feeling or at the very least, make you do a double-take when you see it. Q – Thank you for sharing some of your Epic Shots with our readers. Can you describe how you captured those shots? My pleasure to do so. It brings back an oozing of fond memories! Chiam See Tong is my hero. He stands up for his convictions. I shot him in from of a weather “firing squad” wall on a Sunday afternoon. This image was captured at the prime of his health, before his stroke. 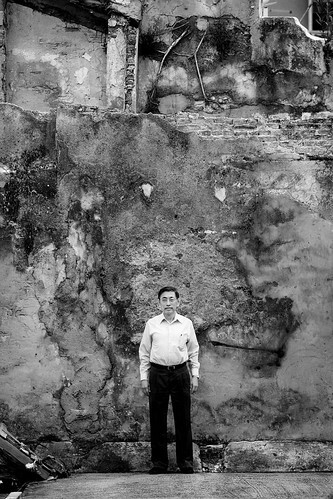 The wall has since been demolished, Chiam is still standing … proudly. I was invited to hang out with Blondie in Woodstock when they recorded their Panic Of Girls album. They kindly featured this in their album centrespread. 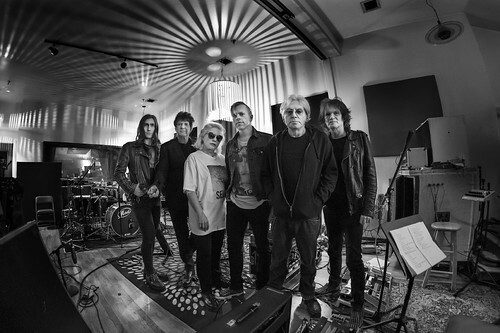 I was again invited to hang out with Blondie in New York when they recorded their Pollinator album, just out on May 5, 2017. It was recorded at Magic Shop studios, where David Bowie recorded his last two phenomenal albums – Blackstar & The Next Day. 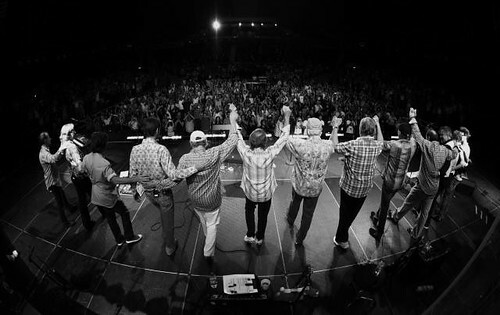 It was with the Beach Boys and their management’s permission that I was allowed to go ON stage to capture this image. At the last bit of the concert, at the start of their song Barbara-Ann, I was to go up the drum riser, literally four feet from their backs. Snap! The moment is immortalised. They loved the shot so much it ended up as their Live album cover! And my other B/W images filled their album CD artwork too. 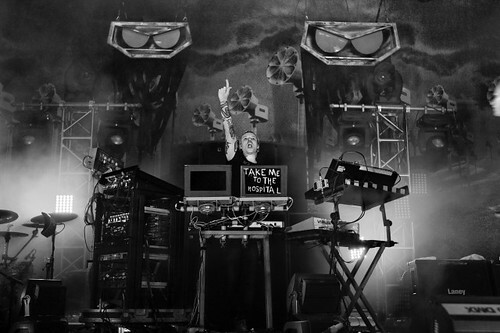 Liam Howlett of Prodigy. “Take Me To The Hospital” is Prodigy’s 21st single. 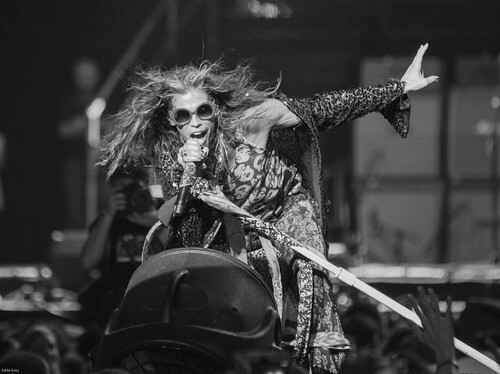 Steve Tyler of Aerosmith is always a visual delight to shoot. I was at a invite-only Tommy Hilfiger event in New York. Steve was a few feet away from me, talking to his animated fans and event attendees. I decided to let him be. Next time perhaps. Haha. I was enjoying the Slipknot concert right ON stage when suddenly Joey Jordison beckoned at me to come to him. What the…? Seconds later I took this iconic image. 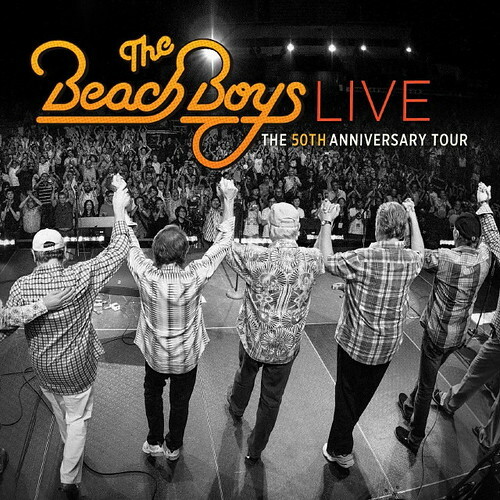 Four months later, it was included in their awesome Live album. Together with eight other images of the other band members! I’m proud that these images are proudly displayed at Hard Rock Café in Singapore. 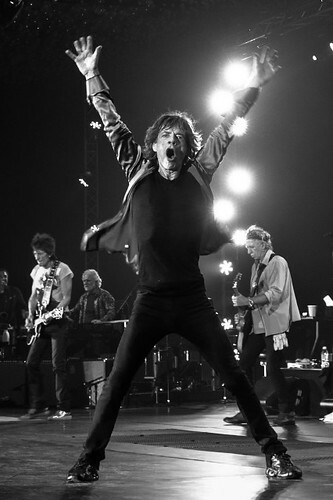 Into his sixth decade of performing, Mick Jagger is the ultimate rock star. As fate would have it – Mick does a Star formation right before my lens! One cannot take a lousy shot of Taylor Swift. Young, talented and business savvy. She goes about her life and music direction – without compromising despite the intense “spotlights” that are trained on her. Respect. 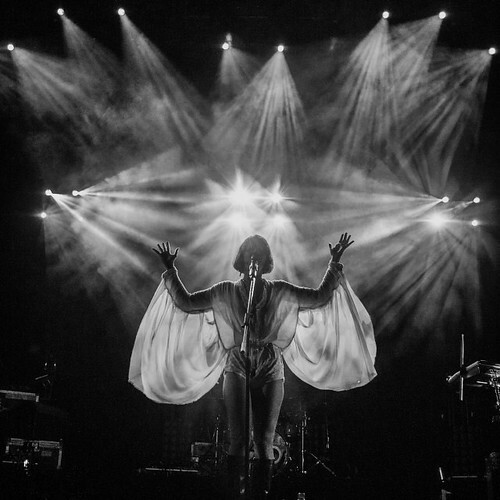 Natasha Kwan aka Bat For Lashes. I love the multiple lights that surrounds her. It helps when her clothing is, shall we say, spot-light-friendly. 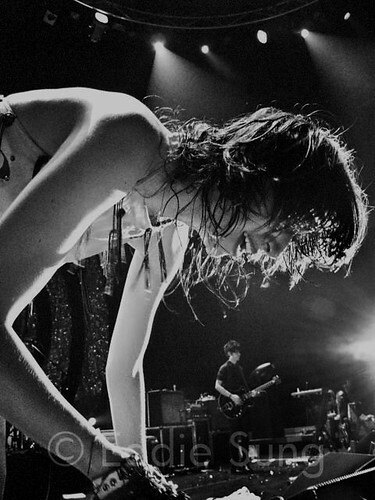 A sweaty Karen O of Yeah Yeah Yeahs was literally a feet from me when I took this shot. It looks like she is going to devouring her guitarist Nick Zinner, who’s an accomplished photographer. 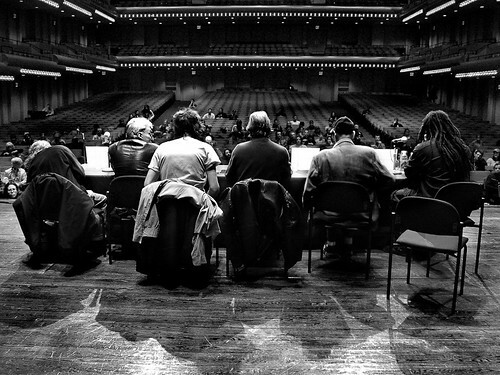 I shot this image of the legendary Who’s Who of New York Punk Rock scene at the Lincoln Center in New York City. From left – Tommy Ramone (Ramones), Chris Stein (Blondie), Mickey Leigh (brother of Joey Ramone), Legs McNeil, Hilly Kristal (founder of CBGB) and Daryl Jenifer (Bad Brains). I was accorded an All Access status so I was able to go on stage and shoot from behind their seats. 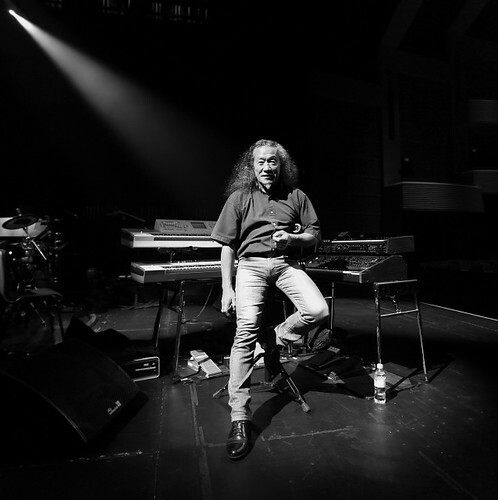 A quick shot when Kitaro-san finished his soundcheck on stage. He was already familiar with my B/W work, so it was easy to get him to pose. I liked that the light shining from the top left of the image directly at him. He loved it so much it made the artwork of his Grammy award-winning album Thinking Of You. I like this smoky aura mood image of Lady Gaga. It took all of a half-second. People tell me it’s like it’s been shot in a photo studio. I take that as a compliment! She turned her head proudly, the light was great, the smoke was threatening. Snap! She was gone immediately after that. 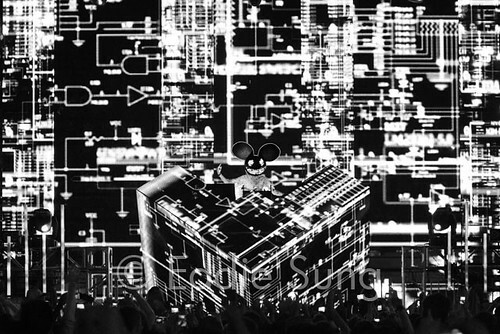 Deadmau5 always delivers a great sound and light show! I waited for a long time for this shot. For the lights on his DJ counsel to be fully lit, for the background lights to be visually appropriate and for him looking straight at my lens. Wait, wait, wait, snap! Here’s the resultant image. Yunwie Malmsteen is not just revered by his fans but also by other legendary guitarists. 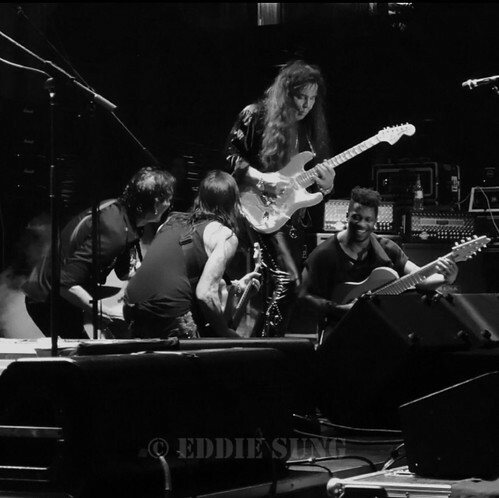 Here Steve Vai, Nuno Bettencourt and Tosin Abasi playfully bow at his feet. A fun and epic shot. In the tradition of remastered classic album CDs, here are some Bonus Shots – here’s some Coloured images (amidst my signature B/W images) that I like. Haha. These are my Crucifixion series. 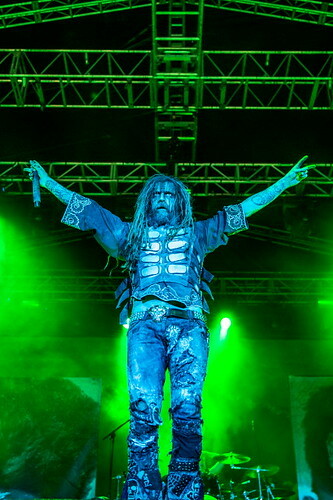 Lady Gaga and Rob Zombie. Both are, in a way, prosecuted for their belief and craft but they always stand firm. Chris Lowe of Pet Shop Boys is a low-profile reclusive performer. 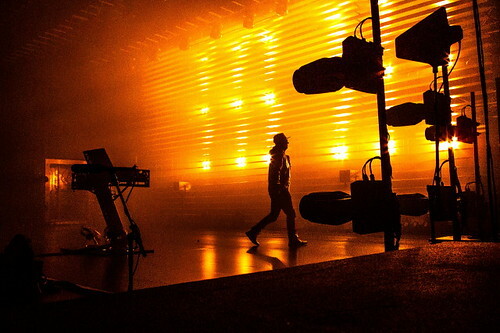 Here he walks across the fully lit stage. A befitting juncture for a visual juxtaposition. Q – Any advice for your young fans on shooting Epic Shots? Be prepared to do your 10,000 hours! Shoot feverishly until you know your camera. Develop your own unique style. Keeping shooting until people know who you are and what you shot.